This public health course immerses students in Boston’s vibrant Chinatown neighborhood. During one of the first sessions of “Introduction to Building Healthy Neighborhoods and Communities”—a new field course offered last fall by the School of Medicine’s Department of Public Health and Community Medicine—five students took a walking tour of Boston’s Chinatown. As they assembled under the neighborhood’s iconic, lion-flanked gate, noises from nearby construction all but drowned out the guide’s voice. Later, in their reflections on the experience, several students wrote about the din. “Being in that environment, hearing that kind of noise, and seeing the hustle and bustle gave them a better sense of what it’s like to live and work in that community,” said professor Carolyn Rubin, who also directs the Addressing Disparities in Asian Populations Through Translational Research (ADAPT), a Tufts Clinical and Translational Science Institute project. And that’s exactly the point: It’s one thing to read studies and textbooks about public health; it’s quite another to immerse yourself in a community’s rich culture and day-to-day life. 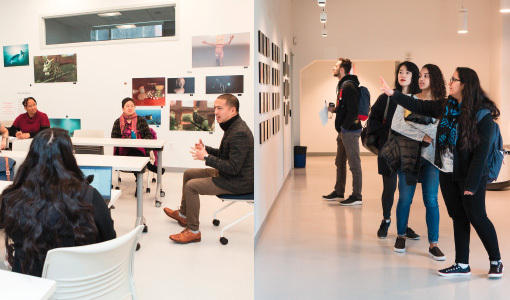 The interactive course—which Rubin will teach again next year—encompasses off-site visits, in-class lectures, and discussions with community partners in Chinatown, a vibrant immigrant enclave that has been squeezed in recent years by high rents and gentrification. Health concerns in the neighborhood include chronic stress, mental health issues, smoking and its consequences, and diabetes and other chronic diseases—as well as obstacles to health-care access. Second-year Doctor of Public Health student Helga Zaire agreed. “It’s very helpful . . . when you talk to people who are facing problems, to hear their views and the way they analyze the situation,” she said. To wit: The final group project focused on how land use affects the overall health and well-being of a neighborhood through the lens of R-1, one of Chinatown’s last remaining parcels of public space. Though Tufts has leased the lot from the city for parking, students interviewed various stakeholders and reviewed documents to recommend ways the university, Tufts Medical Center, and Chinatown can work together to ensure the space benefits all.